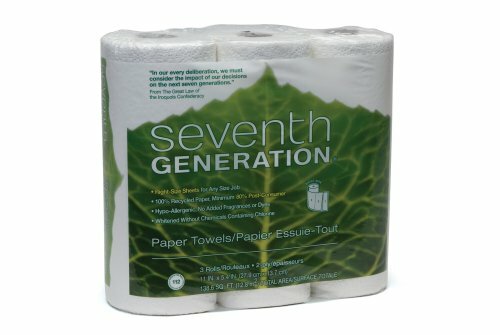 Seventh Generation Recycled Paper Towels absorb spills quickly and work hard, even when wet. These thick and thirsty towels are also lint-free, making them a perfect choice for cleaning windows and other reflective surfaces. And they are made from 100% recycled paper, with a minimum of 80% post-consumer materials, making them the right choice for the environment. By choosing Seventh Generation Recycled Paper Towels, you'll be making an important environmental difference immediately. These paper towels are not whitened with chlorine and are made from 100% recycled paper (80% post-consumer, 20% pre-consumer). 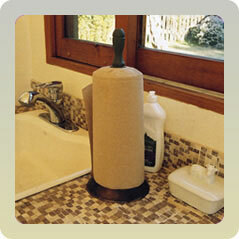 Hypo-allergenic, unbleached, strong and absorbent, these towels will help you keep your home and the environment clean. Post-consumer paper is paper that has been recycled at home or at the office. Buying post-consumer paper helps finish the job you started--of saving the earth's natural resources, including trees, water, and energy. And using products made from post-consumer recycled materials helps reduce the need for virgin wood pulp, which means more trees are left standing. Trees naturally absorb carbon dioxide--a greenhouse gas that's the primary contributor to global warming. In fact, a single tree, over its lifetime, absorbs about one tone of CO2. To put it another way, a ton of recycled paper saves seventeen trees. 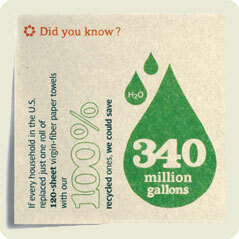 If every household in the U.S. replaced just one roll of 120 sheet virgin fiber paper towels with 100% recycled ones, we could save: 1 million trees, 2.6 million cubic feet of landfill space (equal to over 3,800 full garbage trucks), 367 million gallons of water (a year's supply for 2,800 families of four), and avoid 38,000 tons of pollution. And because these towels have been whitened with an environmentally safe process and have not been treated with chlorine, you can safely compost them in your garden when you're done using them. Seventh Generation offers a complete line of natural household products designed to work as well as their traditional counterparts, but use renewable, non-toxic, phosphate-free, and biodegradable ingredients as often as possible, and are never tested on animals. Seventh Generation products are healthy and safe for the air, the surfaces, the pets, and the people in your home--and for the environment outside of it. 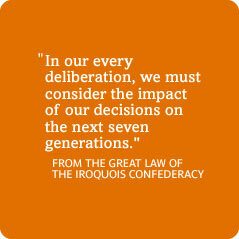 Every time you use Seventh Generation products you make a difference by saving natural resources, keeping toxic chemicals out of the environment, and making the world a safer place for this and the next seven generations. How long will a carton last? 71-yr-old widow, lives alone, plus one dog; fairly liberal usage. 16 months for a carton each of the white paper towels and the 2-ply toilet paper; I'm ready to order again. I love not ever running out of this stuff; I love not having to lug the bulky stuff home from the store. Fortunately I have plenty of storage space. The cartons get broken down and taken to the dump -- no big deal, since all cardboard gets the same treatment here. They are paper towels. Not as thick as Bounty, but that's been okay. The thing I do not like is that they do not tear at the perforation very well at all. Consistently. Wake up Every littel bit helps. These are ok, not super absorbent. I use dish towels and reusable absorbent cloths, but I picked these up when my mom came to visit. She's been known to go through a roll per day. She particularly likes to use, rinse, wring, dry, and reuse any paper towel sheet that she can. These fell apart as soon as they got wet, and forget wringing! Needless to say, she was not happy with these at all, but I don't mind them for cleaning the counter top, dining table, etc, that only requires a one-time use. Not really great with spills, and they seem to leave dishes just as wet as when you started drying them. A strange trait. These are cheap, effective, and low impact.